Raw oysters always draw a crowd – from “buck-a-shuck” happy hours, to oyster bars, and festivals celebrating the delicacy, these bivalves are celebrated for their unique taste and texture. They’re also one of the most well-known aphrodisiacs, and some vegans are even willing to make an exception for them. There’s a serious side to oysters though. As with any food that is consumed raw, food quality and safety is of utmost importance. There’s a lot of behind-the-scenes science that goes into separating good oysters from bad, and farmers and regulators are always looking for ways to test for pathogens more quickly, frequently, and accurately. Oysters are filter feeders, meaning they filter food particles from water through their gills. They can filter up to two gallons of water per hour. This process cleans the water and makes them an important part of maintaining coastal ecosystems. It can also create a challenge for the aquaculture industry. When oysters feed in waters where pathogens thrive, it is possible for them to accumulate bacteria that are harmful to humans in their tissue. One of these pathogens is Vibrio vulnificus. Vibrio is a naturally occurring bacterium found in brackish marine waters, such as bays and estuaries, particularly during the warmer summer months. When raw oysters are loaded with Vibrio there is no noticeable change in taste, odor, or appearance. This means that food safety officials who must rely on science, not their senses, to tell if an oyster is safe to eat. Biomeme has partnered with Bigelow Laboratory for Ocean Sciences to test oysters in their natural habitats. Dr. Peter D. Countway, Senior Research Scientist at Bigelow Laboratory’s Molecular Microbial Ecology Laboratory, is developing real-time PCR technology for the aquaculture industry in collaboration with Biomeme. 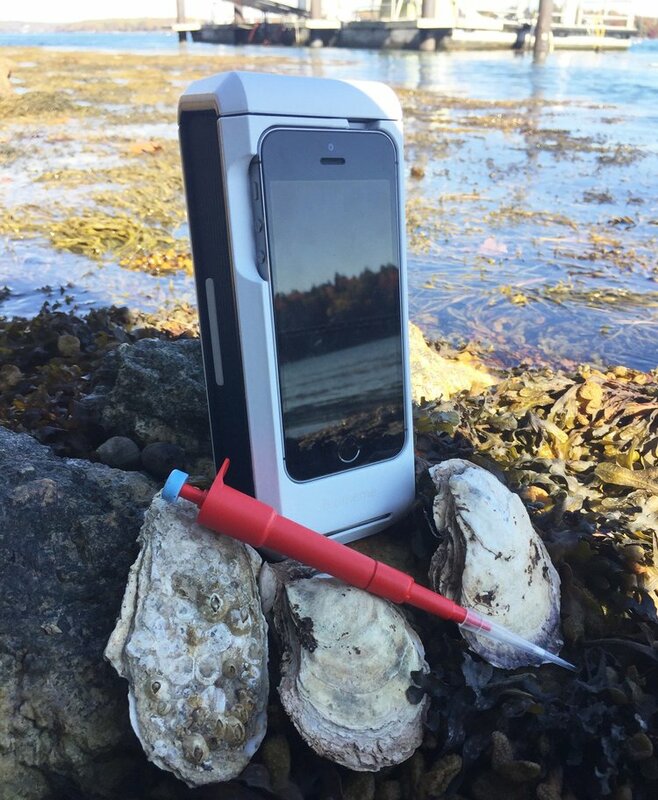 His project aims to utilize Biomeme’s two3 device to detect Vibrio in oysters along the coast of Maine and map any outbreaks in real time. A future goal is to equip and train a network of citizen scientists in the aquaculture community to make regular measurements of microbial species in coastal Maine. The resulting database could help forecast regions where Vibrio might affect oyster populations. By giving laypeople and researchers alike the tools to perform pathogen detection in the field, Biomeme and Bigelow have the potential to revolutionize microbial ecosystem forecasting. Dr. Countway’s research, done in collaboration with Dr. José Antonio Fernández-Robledo and Dr. Nick Record at Bigelow Laboratory, has great potential for improving aquaculture products and protecting the environment, particularly with oysters and potentially expanding to other shellfish. This research is made possible by the Sash A. and Mary M. Spencer Entrepreneurial Fund, a fund awarded to Bigelow Laboratory scientists that provides seed money in support of commercialization activities and collaborations with industry partners. For more information about how to partner with Biomeme and bring your tests into the field, apply to our Developer Program.